This article is about the city. 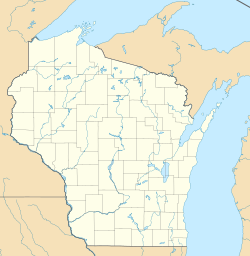 For the adjacent town, see Manitowoc (town), Wisconsin. Manitowoc /ˈmænɪtəwɔːk/ is a city in and the county seat of Manitowoc County, Wisconsin, United States. The city is located on Lake Michigan at the mouth of the Manitowoc River. According to the 2010 census, Manitowoc had a population of 33,736, with over 50,000 residents in the surrounding communities. The city's sister city is Kamogawa, Japan. Manitowoc River, near where it enters Lake Michigan, reflecting the skyline of downtown Manitowoc, with the U.S. 10 highway bridge at left. Wisconsin's Maritime Capital, Clipper City, The Port City, Manty. Location of Manitowoc in Manitowoc County, Wisconsin. Purported to mean dwelling of the great spirit, Manitowoc derived its name from either the Anishinaabe language word manidoowaak(wag), meaning spirit-spawn(s), or manidoowaak(oog), meaning spirit-wood(s), or manidoowak(iin), meaning spirit-land(s). [not in citation given] In the Menominee language, it is called Manetōwak, which means "place of the spirits". The Menominee ceded this land to the United States in the 1836 Treaty of the Cedars, following years of negotiations over how to accommodate the Oneida, Stockbridge-Munsee, and Brothertown peoples who had been removed from New York to Wisconsin. In 1838, an act of the Territorial Legislature separated Manitowoc County from Brown County, keeping the native name for the region. The first Europeans in the area were French fur traders who arrived in 1673. The Northwest Fur Company established a trading post in 1795. In 1835, before the transfer of land from the Menominee Nation to the United States, President Andrew Jackson authorized land sales for the region, drawing the interest of land speculators. William Jones and Louis Fizette were the two first recorded buyers on August 3, 1835, with the majority of the land being procured by the Chicago firm Jones, King, & Co. Benjamin Jones, brother of William, took the Wisconsin property as his share and is considered the founder of Manitowoc. Early immigrant groups included Germans, Norwegians, British, Irish, and Canadians. The first school in Manitowoc was held in the Jones warehouse, with S. M. Peake instructing the twelve children of the community. The first religious organization in the county, St. James' Episcopal Church, first met in 1841. Manitowoc was chartered as a village on March 6, 1851 and on March 12, 1870 was incorporated as a city. In 1847, Joseph Edwards built the first schooner in the area, the Citizen, a modest precursor to the shipbuilding industry that produced schooners and clippers used for fishing and trading in the Great Lakes and beyond the St. Lawrence River. In addition, landing craft, tankers and submarines became the local contributions to U.S. efforts in World War II. On September 5, 1962, a 20-pound (9.1 kg) piece of the seven-ton Sputnik 4 crashed on North 8th Street. Sputnik 4 was a USSR satellite, part of the Sputnik program and a test-flight of the Vostok spacecraft that would be used for the first human spaceflight. It was launched on May 15, 1960. A bug in the guidance system had pointed the capsule in the wrong direction, so instead of dropping into the atmosphere the satellite moved into a higher orbit. It re-entered the atmosphere on or about September 5, 1962. A cast was made from the original piece before the Soviets claimed it, and the cast was displayed at the Rahr West Art Museum. A customer in a nearby art gallery jokingly suggested that the city should hold a festival to celebrate the crash. The city held the first Sputnikfest in 2008, which was organized by the head of both museums. 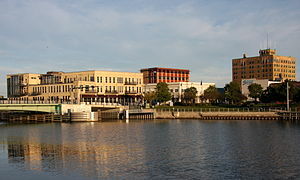 Manitowoc was historically a sundown town that prohibited African Americans from staying overnight. In 1968, the policy forced a visiting Gwendolyn Brooks to stay at Holy Family College, just outside of Manitowoc, after a poetry reading. Manitowoc is home to the Wisconsin Maritime Museum, and is one endpoint of the ferry route of the SS Badger, which connects U.S. Route 10 to Ludington, Michigan. Since the late 1990s, several new shopping centers have opened in the city, mostly on the southwest side of the city along Interstate 43, including the new Harbor Town Center shopping complex. The downtown area has also seen a resurgence, with several new restaurants opening, and the recent announcement of new $100,000+ condominiums on the Manitowoc River, along with a completion of the riverwalk trail. The bulk of the redevelopment in the city has been undertaken by the public/private partnership the Manitowoc County Economic Development Corporation. The Manitowoc River empties into Lake Michigan. According to the United States Census Bureau, the city has a total area of 17.99 square miles (46.59 km2), of which 17.63 square miles (45.66 km2) is land and 0.36 square miles (0.93 km2) is water. The city is located at 44°5′47″N 87°40′30″W﻿ / ﻿44.09639°N 87.67500°W﻿ / 44.09639; -87.67500, on Lake Michigan at the mouth of the Manitowoc River. The nearest other cities are Green Bay, 40 miles (64 km) away, Sheboygan 28 miles (45 km) away, Appleton 47 miles (76 km) away, and Milwaukee 80 miles (130 km) away. Together with Two Rivers and the surrounding towns, the Manitowoc micropolitan area was, according to the 2000 census, home to 52,197 people. The city forms the core of the United States Census Bureau's Manitowoc Micropolitan Statistical Area, which includes all of Manitowoc County (2000 population: 82,887). Manitowoc has a humid continental climate. Lake Michigan has a moderating effect on its climate compared to regions more inland, making it warmer in the winter and cooler in the summer than most nearby cities. Manitowoc has a yearly average high of 52 °F (11 °C) and a yearly average low of 38.5 °F (4 °C). Manitowoc also has an extreme high and extreme low of 101 °F (38 °C) and −27 °F (−33 °C), respectively. The city receives an average of 31.17 in (792 mm) of precipitation every year, in the form of rain and snow, with rain being more prevalent in months April–November, and snow being more prevalent in months December–March. Precipitation is spread fairly evenly throughout the year, with the wettest month being August, with 3.58 in (91 mm) of precipitation, and the driest month being February, with 1.38 in (35 mm) of precipitation. As of the census of 2010, there were 33,736 people, 14,623 households, and 8,600 families residing in the city. The population density was 1,913.6 inhabitants per square mile (738.8/km2). There were 15,955 housing units at an average density of 905.0 per square mile (349.4/km2). The racial makeup of the city was 89.9% White, 1.0% African American, 0.6% Native American, 4.6% Asian, 2.1% from other races, and 1.9% from two or more races. Hispanic or Latino of any race were 5.0% of the population. There were 14,623 households of which 27.0% had children under the age of 18 living with them, 44.5% were married couples living together, 10.0% had a female householder with no husband present, 4.3% had a male householder with no wife present, and 41.2% were non-families. 35.4% of all households were made up of individuals and 14.7% had someone living alone who was 65 years of age or older. The average household size was 2.24 and the average family size was 2.91. The median age in the city was 41.7 years. 22.2% of residents were under the age of 18; 8.1% were between the ages of 18 and 24; 23.7% were from 25 to 44; 27.2% were from 45 to 64; and 18.8% were 65 years of age or older. The gender makeup of the city was 48.2% male and 51.8% female. As of the census of 2000, there were 34,053 people, 14,235 households, and 8,811 families residing in the city. The population density was 2,018.8 people per square mile (779.4/km²). There were 15,007 housing units at an average density of 889.7 per square mile (343.5/km²). The racial makeup of the city was 93.13% White, 0.59% Black or African American, 0.55% Native American, 3.77% Asian, 0.07% Pacific Islander, 0.90% from other races, and 0.99% from two or more races. 2.52% of the population were Hispanic or Latino of any race. There were 14,235 households out of which 28.6% had children under the age of 18 living with them, 49.0% were married couples living together, 9.1% had a female householder with no husband present, and 38.1% were non-families. 32.5% of all households were made up of individuals and 14.6% had someone living alone who was 65 years of age or older. The average household size was 2.32 and the average family size was 2.96. In the city, the population was spread out with 24.1% under the age of 18, 8.2% from 18 to 24, 27.9% from 25 to 44, 21.4% from 45 to 64, and 18.4% who were 65 years of age or older. The median age was 39 years. For every 100 females, there were 93.9 males. For every 100 females age 18 and over, there were 90.9 males. The median income for a household in the city was $38,203, and the median income for a family was $47,635. Males had a median income of $35,176 versus $22,918 for females. The per capita income for the city was $19,954. About 5.0% of families and 7.9% of the population were below the poverty line, including 11.7% of those under age 18 and 7.5% of those age 65 or over. The city government consists of a mayor and a city council with 10 members elected from single member districts. The current mayor is Justin Nickels. The Manitowoc Company, based in the town, grew out of the shipbuilding industry. It was a diversified manufacturer with interests in the construction and Manitowoc Ice Welbilt food service industries. The city is the world headquarters of Lakeside Foods Company, and Bio-Blend Fuels. Burger Boat Company, a yacht builder is located in Manitowoc and produces 2–3 yachts per year. Baileigh Industrial, a manufacturer of metal fabrication and woodworking machines. Orion Energy Systems, specializing in energy-efficient commercial fluorescent and solar lighting. Holy Family Memorial Medical Center with an inpatient medical center including an emergency room, a Cancer Care Center as part of the Regional Cancer Collaborative made up of nine regional hospitals fighting cancer in northeast Wisconsin, a Heart and Vascular Center, regional orthopaedic services, retail pharmacies, a home medical supply retail store, medically based wellness center, state of the art rehab facility, and more than 15 clinics in the county. Aurora Health Care with one main campus in Two Rivers, and several dozen health clinics throughout the county. Manitowoc Herald Times Reporter—Daily newspaper owned by Gannett Newspapers. Lakeshore Chronicle—Printed on Sundays and Wednesdays only. Also owned by Gannett Newspapers. Manitowoc is part of the Green Bay television market, although it is not uncommon for residents to receive stations over-the-air from Milwaukee, and across the lake from the Grand Rapids and Traverse City/Cadillac markets. No television stations originate from Manitowoc, and the only full-time presence of Green Bay stations in the city are remote-operated weather cameras and WFRV-TV featuring some Herald Times Reporter content in newscasts as part of a promotional agreement with Gannett's northeastern Wisconsin newspapers. Comcast holds the city's cable franchise, inherited from the company's earlier purchase of Jones Intercable, and the city has the only presence of Comcast in all of Eastern Wisconsin. Manitowoc is classed as part of Nielsen Audio's Sheboygan/Manitowoc radio market and combined with Two Rivers, and stations from both Sheboygan and Green Bay are easily heard in the area. Since 2017, Seehafer Broadcasting has owned all six local radio stations broadcasting in Manitowoc County. The Franciscan Sisters of Christian Charity have their mother house in Manitowoc. In 2005 the Roman Catholic Diocese of Green Bay merged several Catholic parishes in the city into one parish, St. Francis of Assisi Catholic Church, with a 4-man pastoral team led by Father Dan Felton. In 2005, the Herald Times Reporter reported that the city has roughly 22,000 Roman Catholics. The Wisconsin Evangelical Lutheran Synod is a significant Christian synod in the city with four large churches and Manitowoc Lutheran High School. Two additional Wisconsin Synod churches are outside the city limits with a Manitowoc address. St. James' is an historic Episcopal church in the city. The Church of Jesus Christ of Latter-day Saints has a meetinghouse in Manitowoc. The Rahr West Art Museum is housed in a 19th-century mansion near downtown Manitowoc. Donated by the Rahr family in 1941 for use as a community civic art center, it has been since expanded numerous times. The Museum currently houses art ranging from the 15th–21st centuries, with paintings, sculptures, and a preserved Victorian home in its possession. The Wisconsin Maritime Museum was founded in 1970 as the Manitowoc Submarine Memorial Association, and has since grown to be one of the largest nautical museums in the country; it has recently been granted affiliation status with the Smithsonian. It has over 60,000 sq ft (5,600 m2) of interactive and standing exhibits exploring maritime history with a particular emphasis on the Great Lakes. Perhaps the Museum's crown jewel however is the World War II era USS Cobia, an authentic combat submarine similar to those built in Manitowoc during the war. There are daily tours of the vessel, which is moored in Manitowoc's harbor, allowing visitors a look at Manitowoc's role in the war and building 28 submarines for the U.S. Navy. The Lincoln Park Zoo is a year-round zoo and is part of the Manitowoc Parks and Recreation Department. The Lincoln Park Zoo has tours and educational programs available for small and large groups. Public transportation in the city been provided by Maritime Metro Transit since 1978, covering both Manitowoc and Two Rivers, Wisconsin. MMT currently has a fleet of 12 buses serving over 40 stops on 8 routes. Manitowoc is the western port for the S.S. Badger ferry, that crosses Lake Michigan to Ludington, Michigan. The ferry ride is part of the route of U.S. Route 10. The Manitowoc Mariners Trail is a 5.5-mile (8.9 km) paved recreational trail running along the shore of Lake Michigan between the cities of Manitowoc and Two Rivers, Wisconsin. I-43 Northbound routes to Green Bay, Wisconsin. Southbound, routes to Sheboygan and Milwaukee, Wisconsin. US 10 travels east across Lake Michigan via car ferry to Ludington, Michigan, and west to Appleton, Wisconsin. U.S. 151 Southbound, US 151 routes to Chilton, Wisconsin. WIS 42 travels south to Howards Grove, Wisconsin and north to Sturgeon Bay, Two Rivers and Kewaunee, Wisconsin. Manitowoc County Airport (KMTW) serves the city and surrounding communities. Andrew Miller, Medal of Honor recipient. Wilbur Schwandt, songwriter, "Dream a Little Dream of Me"
^ Muench, David "Wisconsin Community Slogans: Their Use and Local Impacts" Archived March 9, 2013, at the Wayback Machine, December 1993. Retrieved April 9, 2008. ^ Campbell, Henry Colin (1906). Wisconsin in Three Centuries, 1634-1905. Century history Company. ^ Bogue, Margaret Beattie (1985). Around the Shores of Lake Michigan: A Guide to Historic Sites. University of Wisconsin Pres. ISBN 9780299100001. ^ "Indian Land Cessions 1784-1894". National Park Service. Retrieved October 5, 2018. ^ "Menominee Treaties and Treaty Rights". Indian Country Wisconsin. Retrieved October 5, 2018. ^ "Chapter II: The Indians", A History of Manitowoc County, Ralph G. Plumb, 1904. ^ a b c "History" Archived June 10, 2002, at the Wayback Machine, City of Manitowoc site. Retrieved May 29, 2008. ^ "Manitowoc - Two Rivers History". Manitowoc - Two Rivers Travel Information. Retrieved October 5, 2018. ^ "Chapter III: Early Settlement", A History of Manitowoc County, Ralph G. Plumb, 1904. ^ "Chapter XIII: Education", A History of Manitowoc County, Ralph G. Plumb, 1904. ^ "Episcopal and Methodist Episcopal Churches", A History of Manitowoc County, Ralph G. Plumb, 1904. ^ "Chapter VI: Marine", A History of Manitowoc County, Ralph G. Plumb, 1904. ^ a b c Mathews, Charlie (September 7, 2008). "Having a blast with the past at festival". Herald Times Reporter. Retrieved November 11, 2008. ^ "Sputnik Crashed Here". Roadside America. Retrieved November 11, 2008. ^ "SLC dedicates office to African-American poet". The Herald Times Reporter. Manitowoc, Wisconsin. February 28, 2017. p. 3A – via Newspapers.com. As an African-American, Brooks was not allowed to stay overnight in Manitowoc, a 'sundown town,' after she gave a poetry reading in the city on May 9, 1968. ^ "Manitowoc, WI Monthly Weather Forecast - weather.com". Retrieved August 11, 2015. ^ "Climate Manitowoc – Wisconsin and Weather averages Manitowoc". Retrieved August 11, 2015. ^ Grocery cashier, 22, beats MIT grad to become Manitowoc mayor (April 8, 2009) (archived from the original on 2009-04-11) htrnews.com. ^ Matthews, Charlie (September 25, 2014). "Baileigh Industrial builds iconic cars from scratch". The Post-Crescent. Retrieved February 11, 2015. ^ "Meetinghouse Locator | LDS Maps". www.lds.org. Retrieved January 23, 2019. ^ "Manitowoc, WI – Official Website – Parks and Recreation". Manitowoc.org. Retrieved August 6, 2010. ^ THE LEGISLATIVE MANUAL OF THE STATE OF WISCONSIN (16th ed.). Madison, Wis. 1877. p. 466. ^ "Stoney McGlynn Statistics and History". Baseball-Reference.com. Retrieved August 6, 2010. ^ Doug Sterner (December 12, 1944). "Wisconsin Medal of Honor Recipients". Homeofheroes.com. Retrieved August 6, 2010. ^ Lawrence Kestenbaum. "Index to Politicians: Randall to Randol". The Political Graveyard. Retrieved August 6, 2010. ^ "Karl L. Rankin". Nndb.com. January 27, 1997. Retrieved August 6, 2010. ^ Lawrence Kestenbaum. "Index to Politicians: Scacco to Schafe". The Political Graveyard. Retrieved August 6, 2010. Wikimedia Commons has media related to Manitowoc, Wisconsin.